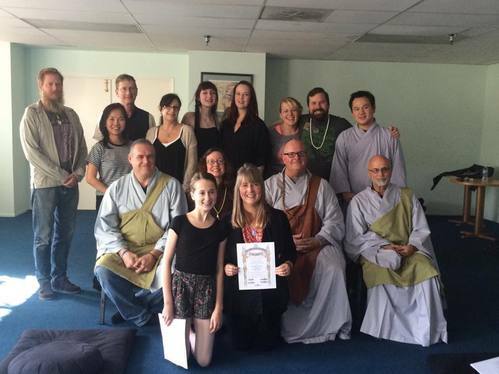 The Ocean Eyes Zen Center is formed for the purpose of establishing and maintaining public worship and teachings in accordance with the principles and doctrines of the Zen Buddhist Faith through a lineage of Masters, culminating in the teaching of Ven. Dr. Wonji Dharma, and thereafter through the teachings of Masters and Teachers appointed by him. These teachings are carried on through the formal education and the intuitive realization of the Sangha's members to save all beings from suffering, through developing charity, love, compassion and awareness. The community consists of Ven. Wonji, his Dharma Successors, and teachers as they are recognized, as individuals, who have been formally authorized. There are no affiliations with other Zen groups or religious denominations; however, membership in this community does not preclude individual affiliation with other groups. Within the Sangha there is no hierarchy of Dharma Successors. Ancestral Zen is universal; the medium and methods to realize it vary according to each individual’s circumstances. Each Dharma Successor in the community may apply varied practice approaches and resolve on the structure of any organization that s/he may develop to facilitate practice. The Dharma Successors recognize that they are ongoing students and the value of their teaching derives from the quality of their practice. As continuing students, these teachers are dedicated to the openness and flexibility of practice, wherein the wisdom of the unconditional may be manifest in life. A vital constituent of this community is the continuing examination and expansion of efficacious instruction approaches to ensure all-inclusive observation in all aspects of living.